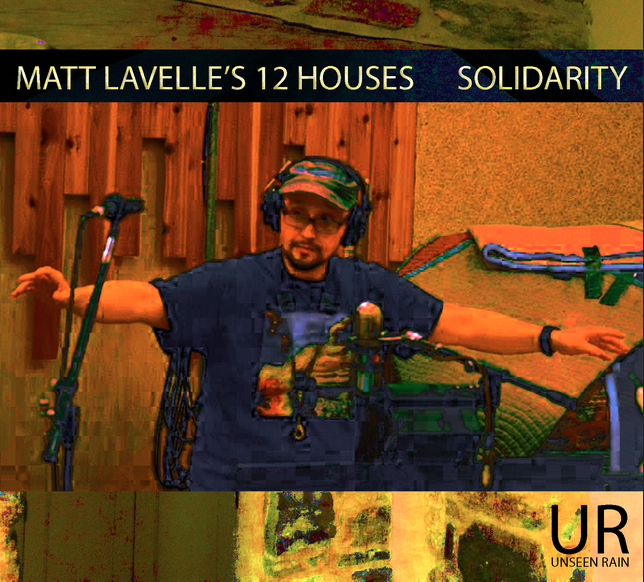 12 Houses is a modern jazz big band mixing composed and free sections, and has been a labor of love for Matt Lavelle for the past 10 years. He wears many hats on their first recording, playing cornet, flugelhorn and alto clarinet in addition to conducting the ensemble. 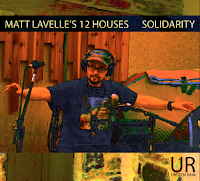 The title song “Solidarity” opens the album and develops some really beautiful horn textures that are alternately dark and stolid, bright and swirling. The band develops to a pace that allows solo and smaller groupings to whip out of the full band for short individual statements before being being re-absorbed. There is a very exciting format to “Brooklyn Mountains” where massive slabs of noise are juxtaposed against increasingly torrid improvisational sections for tenor saxophone, bass, piano and drums. For each blast of full band noise, the quartet, counters harder and faster, making for an excellent dynamic. Lavelle has battled serious knee problems in the past and “Knee Braces” faces this problem head on through music. The somber music of the bands opening is a reflection of the personal pain that he has endured during the past few years. The pain is manifested and made whole by the haunted long tones of dark violin and cello. The raw strings and solemn horns speak to difficult times and the willingness to go on regardless of the cost. “Cherry Swing” features some deep and buoyant drumming and ripe cornet playing that explodes into a kaleidoscope of color with the band alternating between swinging and squalling and Lavelle’s wonderful cornet soloing over bass and drums. There is a short unaccompanied section called “Moonflower Interlude” for baritone saxophone, which has a forlorn yet proud feeling and leads the band into the final track, “Faith.” On this song there is a gentle piano opening, which allows the full band to slowly build around the rousing sound of the human voice. The piano trio moves to the fore before handclaps take the beat and swinging horns and wailing voice make for a stirring conclusion. This was a very good album, many years in the making. If you haven’t been following Matt Lavelle’s blog, you should definitely do so. Not only will you learn more about the band, but also Matt is a fascinating guy and his writing about music and life in general is well worth your time. Solidarity - Unseen Rain Records.